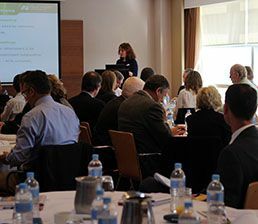 The next Plant Health Australia (PHA) member meetings will be on 28-29 May 2019 in Melbourne. Further details and a program are available on the Events page. Fostering government-industry partnerships in biosecurity is at the heart of why PHA exists and why the company continues to be valued by members. In order to maintain the integrity, responsiveness and capability of the national plant biosecurity system, stakeholders must be able to participate and need to have a mechanism that allows them to reach shared positions and outcomes. PHA’s independence and broad membership structure create the conditions for governments and industries to engage constructively, while the company’s track record in brokering solutions to difficult problems instils confidence in partners. To maintain this successful formula, PHA places a priority on engaging with members. To encourage dialogue, PHA staff members endeavour to speak with and listen to representatives at every opportunity; at member meetings, conferences, field days, workshops and a range of meetings across the country. They also raise issues on behalf of members on a large number of national committees relevant to plant biosecurity. Twice a year industry members are invited to Plant Industry Forums convened by PHA, providing representatives with an opportunity to meet, exchange ideas, consider plant biosecurity matters of mutual interest and discuss solutions. Signatories to the Emergency Plant Pest Response Deed are also given the chance to meet and discuss issues related to the Deed. PHA also facilitates member involvement in project-specific steering and management groups where appropriate. PHA ensures that members are consulted in the setting, implementation and uptake of program objectives and outputs of the company. Thorough and effective company reporting, together with transparency and accountability in business activity, fosters confidence in the company’s performance.